The bitter slugfest ahead of the Gujarat polls receded into the background today as political leaders gathered to pay homage to the martyrs of the 2001 Parliament attack. 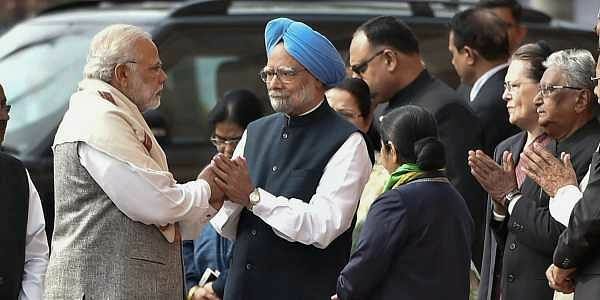 NEW DELHI: The bitter slugfest ahead of the Gujarat polls receded into the background today as political leaders, including Prime Minister Narendra Modi and his predecessor Manmohan Singh, gathered to pay homage to the martyrs of the 2001 Parliament attack. Modi and Singh greeted each other warmly at the sombre ceremony, held in the Parliament House complex. Vice President and Rajya Sabha chairman M Venkaiah Naidu, the prime minister, Lok Sabha Speaker Sumitra Mahajan, Manmohan Singh, BJP veteran L K Advani, Congress chief Sonia Gandhi, her son Rahul, several senior ministers and politicians showered petals at the portraits of the bravehearts killed in the attack 16 years ago. When Singh greeted Modi with a 'namaste' just before the ceremony, the latter cupped his hands. Earlier this week, Modi had accused Singh of colluding with Pakistan to ensure BJP's defeat in Gujarat. Singh had hit back at Modi for allegedly spreading "falsehood and canards" to "score political points in a lost cause". On December 13, 2001, five heavily-armed gunmen stormed the Parliament complex and opened indiscriminate fire. Five Delhi Police personnel, a woman Central Reserve Police official, two Parliament watch and ward staff, a gardener and a camera person were among those who lost their lives in the attack. "The nation is ever grateful to the martyrs who laid down their lives to protect the Parliament, the temple of democracy," the vice president tweeted. Prime Minister Modi said the sacrifice of those killed will not be forgotten. "We pay homage to those who laid down their lives protecting the temple of our democracy on 13th December 2001. Their sacrifices will never be forgotten," he wrote on Twitter. Union ministers Smriti Z Irani and Rajyavardhan Singh Rathore also paid their tributes. "Homage to martyrs whose supreme sacrifice to protect our temple of democracy will never be forgotten by a grateful Nation. #ParliamentAttack," Irani said in a tweet. "13th December, 2001. Today marks 16 years since the cowardly terrorist attack on our Parliament: the shrine of our democracy. I pay homage to all the brave security personnel who laid down their lives protecting it," Rathore said.